Hear KUAR's interview with sculptor Sabin Howard. 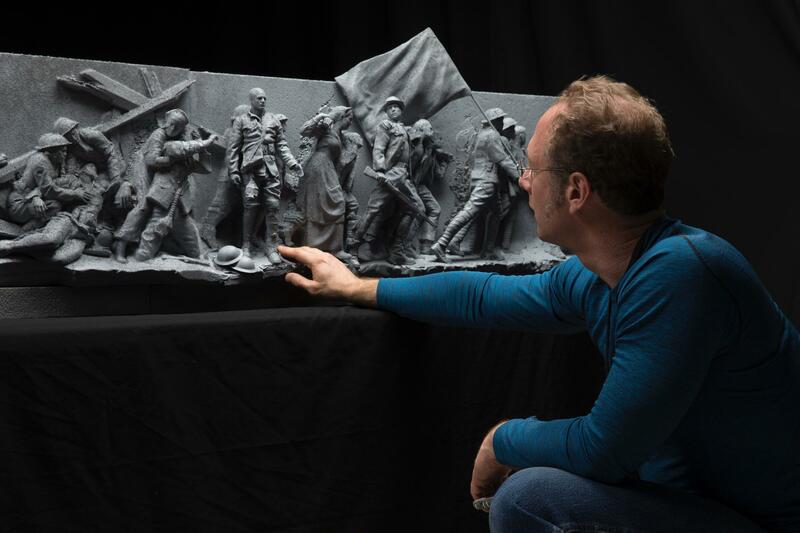 Sculptor Sabin Howard with a physical fabrication of the World War I memorial being constructed. Work is progressing ahead of a ceremonial groundbreaking on Nov. 9 for a National World War I Memorial in Washington, DC commemorating the service of Americans in the military. The memorial likely won’t be completed as initially hoped in time for 100th anniversary of the end of the war, but substantial work should be visible by then. The project is being led by architect Joseph Weishaar, a graduate of the University of Arkansas Fay Jones School of Architecture and Design, and New York sculptor Sabin Howard. Their proposal was selected by a Congressional committee in January 2016 from 360 submitted. The National Capital Planning Commission recently voted to accept a conceptual design for the memorial in Pershing Park near the White House, despite some concerns about the impact it would have on the site. The memorial is being privately funded, with about $14 million raised so far, according to the U.S. World War I Centennial Commission, with an overall price tag expected to be in the range of $40 million. Howard is currently working on completing sculptural elements. He spoke with KUAR during All Things Considered to give an update on the project. MICHAEL HIBBLEN: First off, I know there have been some design revisions over the summer. Where are you in finalizing the design? SABIN HOWARD: Well, we got conceptual design approval on May 18th. It’s the first time I presented [to the Commission of Fine Arts, which is an independent review agency of the federal government] and I showed them the drawing that the commission and myself had worked on and collaborated on for over 12 months. It was the final iteration of nine iterations of the relief wall that is approximately 65 feet long in length. HIBBLEN: And can you visually describe a little more of what this look. HOWARD: Absolutely. Just to give you a little background, I’m a traditional sculptor. I’ve been doing this for 30-plus years, and my training comes out of a very European traditional way of working, and I joined up with a group in New Zealand to get this done in a very quick way. I have to present a maquette in mid-February [to the Commission of Fine Arts], so I have to create a maquette sculpture, which is a nine foot-version. It’ll be 11 feet high eventually, and the length starts on the left side because everything progresses towards the future on the right side. It’s called “A Solider’s Journey.” And in this relief, which is high relief, it’s a very dramatic visceral tale of one man: how he leaves his daughter and wife, and then he proceeds into battle, and in the middle of the relief is a very charged kinetic battle scene that then continues into the cost of war. So you have this very dramatic ending, and then this crescendo into this return home, but it’s designed in a way that as you walk along this wall – this relief wall – it will be very much a cinema graphic experience where the scenes change. And, it ends with the father returning home and handing his daughter his helmet and she’s the next generation, which is obviously World War II. A physical fabrication of the World War I memorial. HIBBLEN: What do you think looking at the design at this stage? HOWARD: I think that when [the Commission of Fine Arts] sees this, and I can't put words into their mouths, but I think they're going to be extremely pleased with this, seeing something that has received so much energy and thought, and there's something very modern about this in that I took... my idea stems from the Parthenon. And the Parthenon had a relief frieze that was 65 feet up in the air. So I'm taking that concept that is unattainable and out of reach and I'm putting that idea of a visual narrative in a relief format at street level where the visitors can actually reach out and touch the sculpture. And the experience that they will have is like non other that has ever happened historically. It's attainable, it's art that is not beyond them, it's at human scale. This piece is done for the general public. It's meant to create a huge amount of emotion for the general public when they see it so the interest in World War I will not be just a didactic, boring experience when they visit the memorial. It's meant to really charge people and give them a real experience of what World War I looked like. And that's what I'm doing. I'm creating a visual narrative and the way I'm doing it is completely revolutionary. I'm very excited and charged to show this to people come January when it's completed because something like this has not been done for over 200 years. 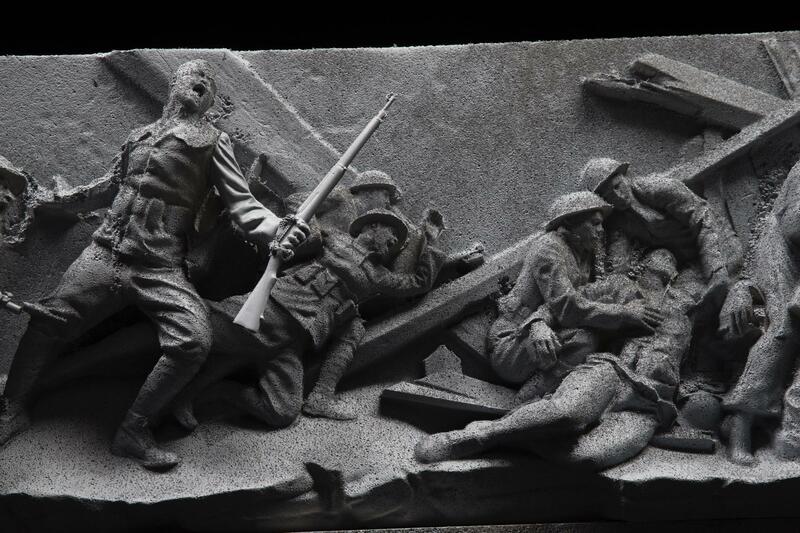 A close look at one section of the sculpture for the World War I memorial. HIBBLEN: And I imagine it must be a lot of pressure to create an appropriate monument for World War I, something that’s so important in our nation’s history. HOWARD: Yes, there are many people that I’m answering to, but also I’ve had to take the reins and make very specific decisions on how do I get something completed in a way that’s timely yet at the same time is museum quality. So we’re not just making a monument. We’re making here a piece of fine art, and Washington really has not seen something like that since the time of the Lincoln Memorial. And my favorite memorials are the Lincoln Memorial and Maya Lin’s (Vietnam Veterans) Wall as well, so what I am creating is in that wheelhouse and follows the tradition from both, something that was done traditionally and something that is very modern, and so it’s a mixture of the two. HIBBLEN: Do you think you’ll meet the goal of having this ready to open by November of next year? HOWARD: I don’t think that is in the cards right now, but the funding is going very well and just because there’s certain government approvals that… they are what they are and so it’ll be in progress at that point. HIBBLEN: But something that I guess can be celebrated? HOWARD: Yes, absolutely. I would assume that at that point there will be a very strong concept that will have been passed through and work will be in progress and there will be a lot of excitement and buzz around the project. This story has been revised to correct that the name of the review panel is the Commission of Fine Arts, which is an independent design review agency of the federal government. A native Arkansan is leading the design of a World War I Memorial in Washington, DC. On Thursday, 25-year-old Joseph Weishaar was honored for his role in the project during a ceremony at the Arkansas State Capitol that formally established a centennial commemoration committee for the state. Weishaar is a recent graduate of the University of Arkansas Fay Jones School of Architecture who today lives in Chicago, but is preparing to move to Washington to oversee the project.